No, we weren't armed with revolvers, we were packing today, and for the first time this year it was hot. Lovely ! 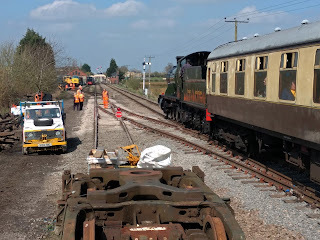 Trains were one steamer and one diesel today - here is the steamer coming off shed, waiting to be let into the station. What a lovely railway atmosphere here. Behind them is the valley where Hayles Abbey used to stand. 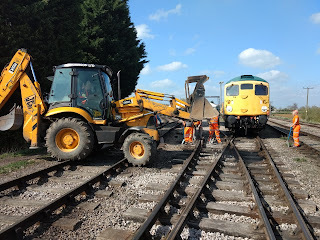 On arrival at the yard, we noticed that our Telehandler was being used by the loco dept, but they let us have their small one. Nigel ran up to Alan, wondering if the machine had shrunk. What is this that you've brought along? Although the little machine could boom out, the safety soon cut in and in practice it couldn't handle the distance that we needed it to go, so we resorted to shoveling the ballast out of the bucket. I say 'we' but your blogger finds himself with tennis elbow and can't use his right arm. Embarrassing, but it now needs rest, not shoveling. Duff jack carrying with the left arm works OK though. Here the full bucket from the little machine is offered up, to be emptied by hand. 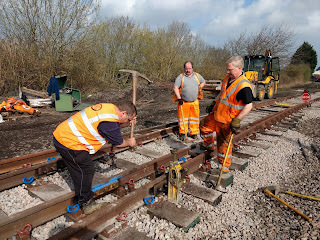 The bearers laid into the check rail to stop it filling up weren't needed, as the machine couldn't tele out that far. 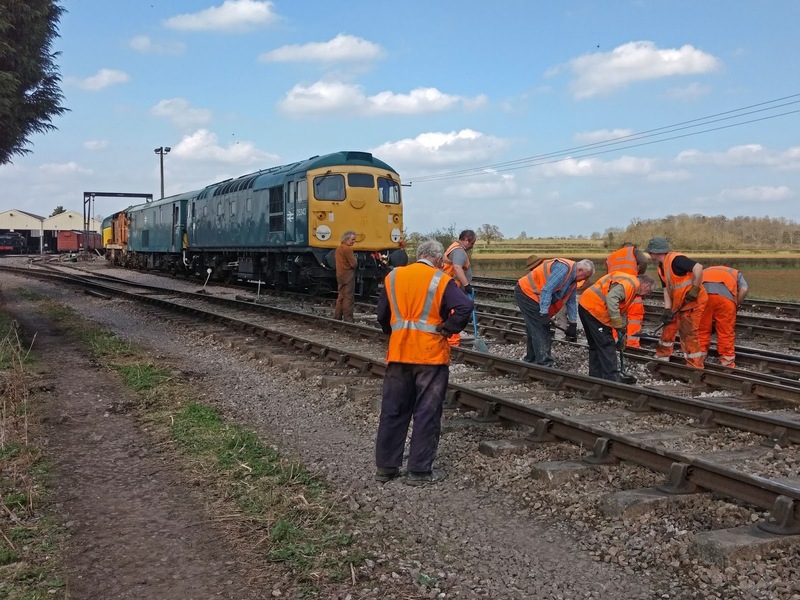 Next came the packing bit, using the ballast just brought in. We're going to start by hand, and probably finish off with more serious Kangos next week. Steve gives it a good bit of welly, while others already take a rest. It's hard work. 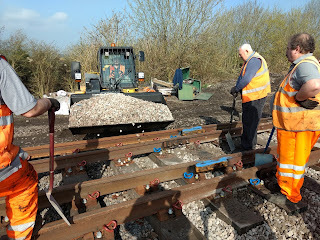 The levels are checked with a fairly precise instrument, here being employed by Tony to see what effect the jack on the right has had after being cranked up a few inches. In the middle of this stretch there was a cant of 30mm, which we removed successfully. This is the middle of the level. A bubble on the left is centered using the small knob on the right, and when it's in the middle, a reading on the panel on the right tells you how far one side is higher than the other - the cant in question. Here's a detail shot of the read out. 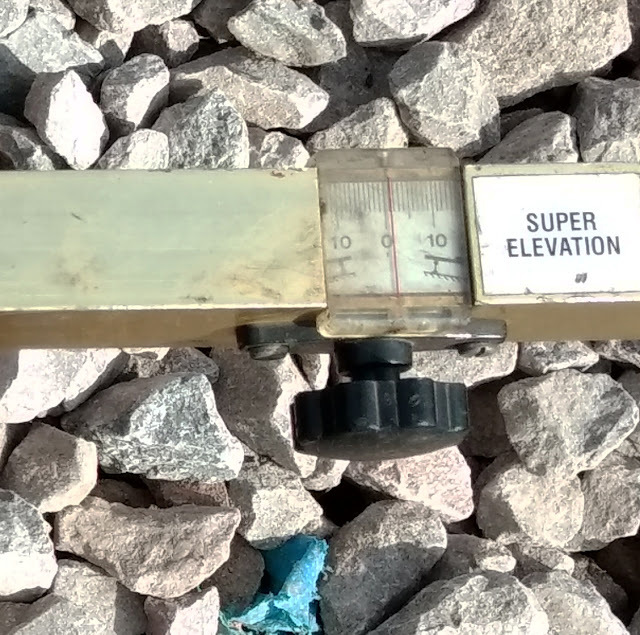 In this case the display shows that the track is level - which is what we intended - with a reading of zero. You can centre the bubble by turning the knob and when it's in the middle, the figures tell you how many mm of cant you have, left or right. Of course on certain sections you might want a degree of cant, and this is how you measure it. 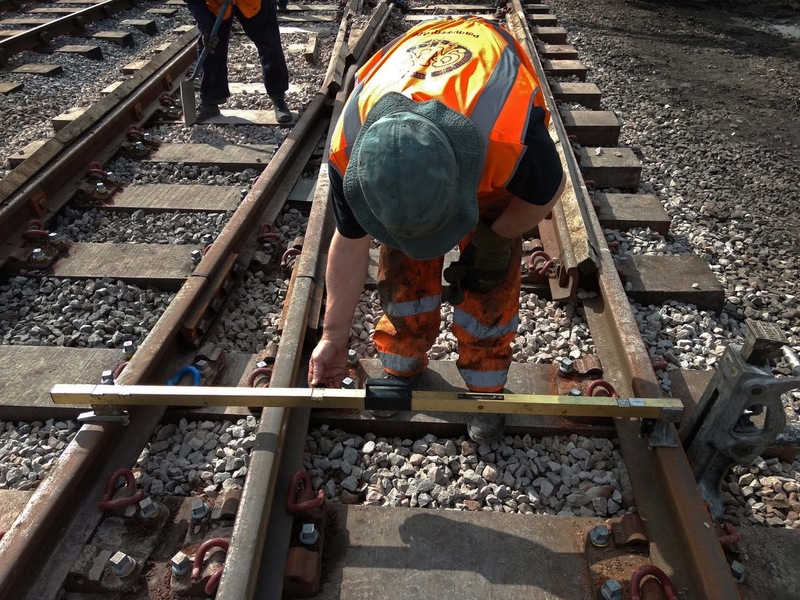 Before jacking up the offending rail to the desired height - up to 30mm today - you need ballast in the cribs. 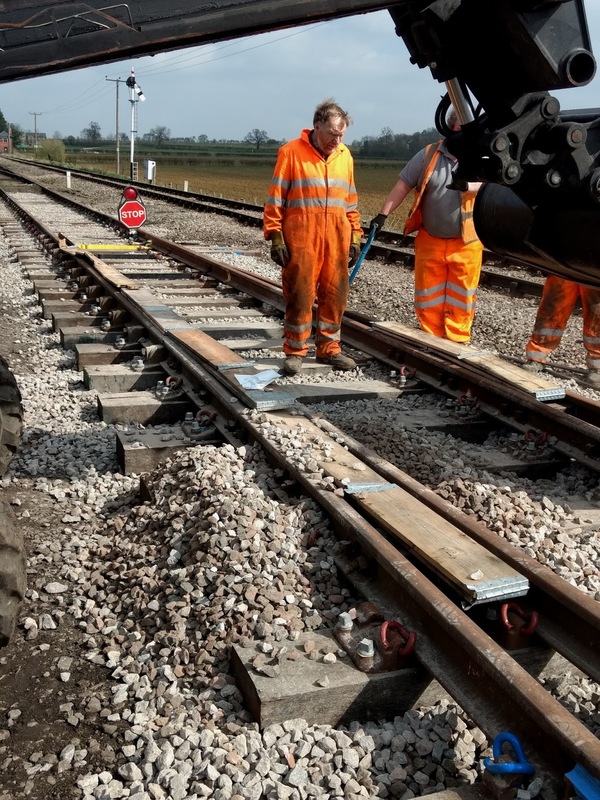 Here the little Telehandler, having part discharged his load in the foreground, is able to stretch a little further and the carefully placed boards finally work, to protect the switch blades from the stones. Having spent most of the morning shoveling and packing, our valiant little gang collapses on to a trolley for a few precious moments to savour between arrivals of fresh ballast from the car park. Behind the trolley a second activity centred around ballasting the start of the headshunt siding, which drops back down quite quickly here. 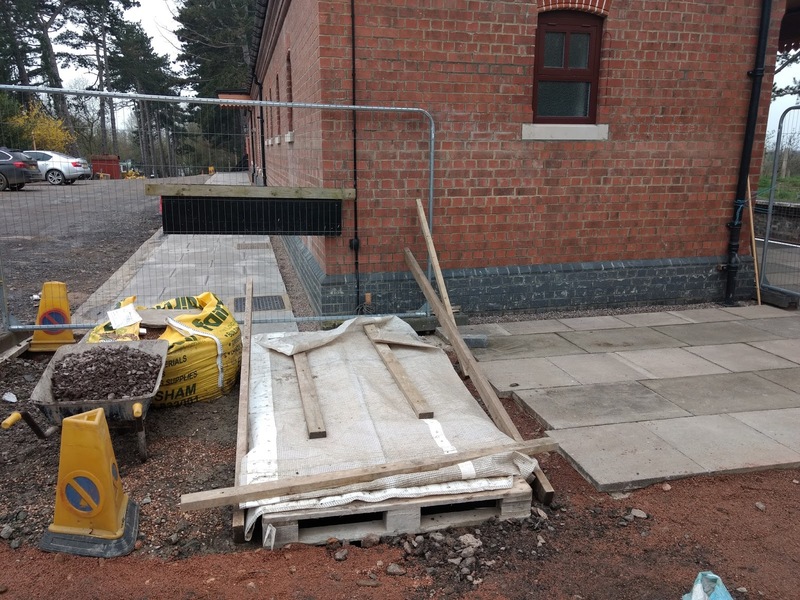 We're starting to tidy up the site, ready to sign off the job, perhaps as early as next week. 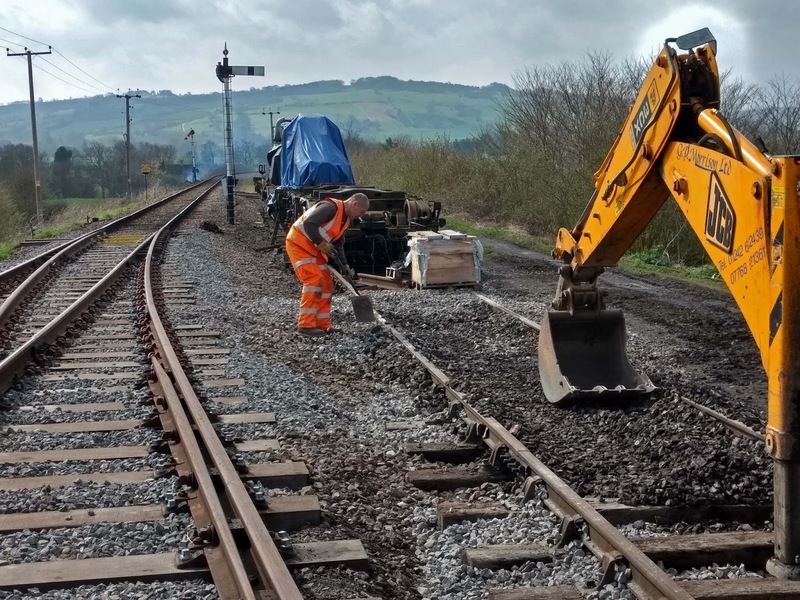 Steve helps with ballast spreading with the back actor, as letting one man - in casu David - do it all is asking a bit much. At the pointy end stretcher bars have been fitted. This now allows the use of a regular clamp to secure the blades in the through road position. Actual use of this new turnout is not expected for a few months yet, but we needed the non-running season to get the other turnout into the running line. This is being traversed every day now by regular trains. 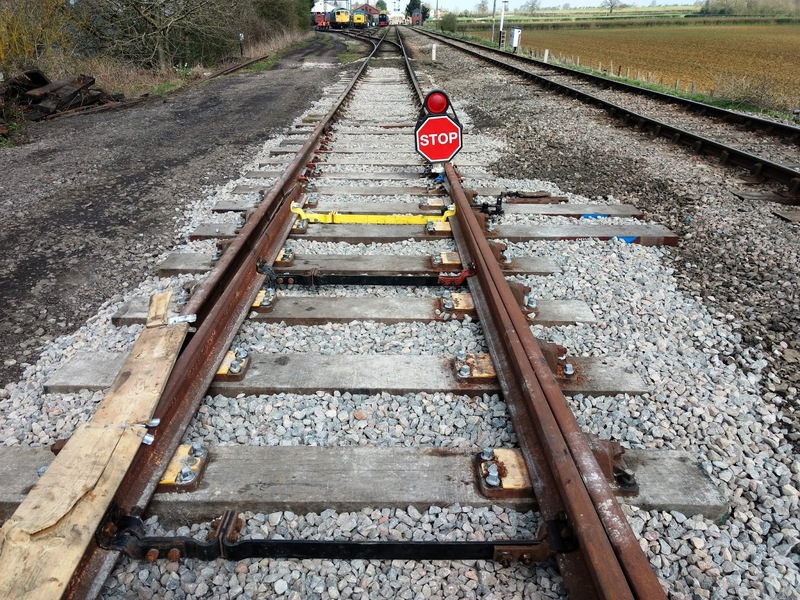 Beyond the STOP board is the short stretch of plain track we resleepered last week. This also received ballast today. Today we were buzzed by a plane flown by Tim, a friend of David and Diana. He's in a plane called an Aeronca Champion, or Champ. We waved enthusiastically, and in return saw dives and tight turns round the field next to us. David normally flies a Boeing Stearman, a biplane from the 1930s used as a trainer but now often seen in flying displays. This is his day job, believe it or not. In between shoveling a welcome break was always the passage of a passenger train. 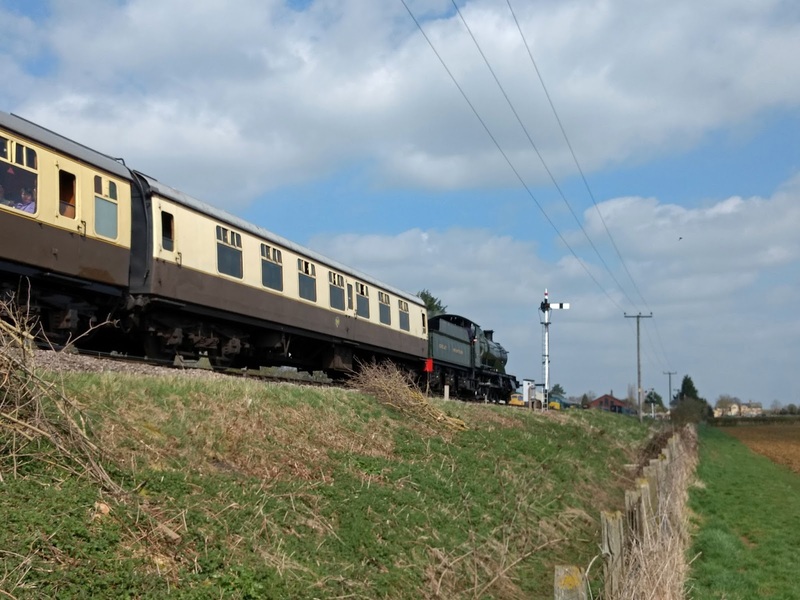 Today the maroon rake was hauled by our class 47 diesel. 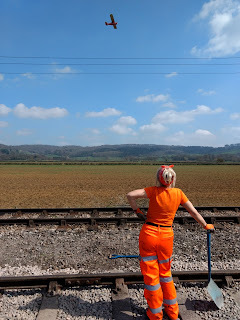 As we are here still within the 10mph station limits speed restriction, there isn't much clag to see, alas. With the slow speed we got plenty of opportunity to study the passengers, and were pleased to see that there were lots of them. Mid day almost every table / compartment was taken. The other loco out was 2807 today. The warm sun really brought people out in droves, which is good news for our income. 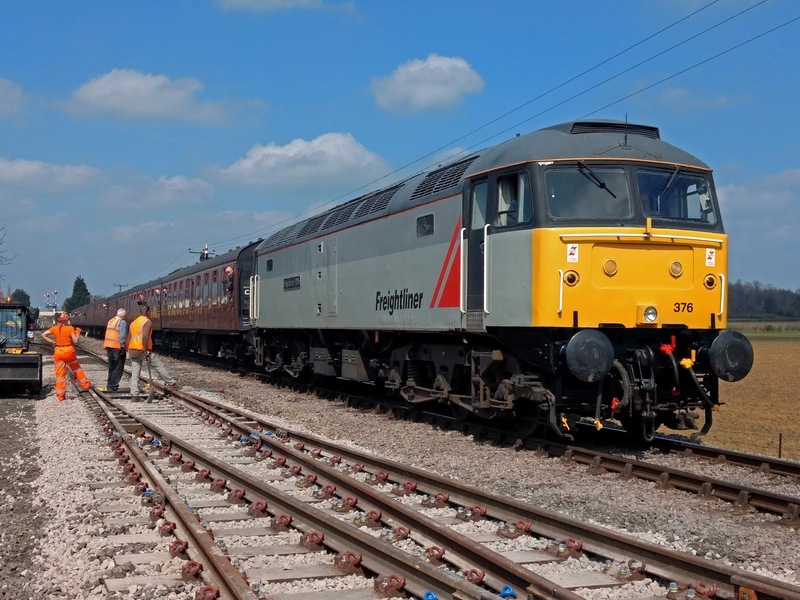 It's quite an impressive loco, 47 376. It was built in 1965 but still looks very modern. The type ran down our line before closure. 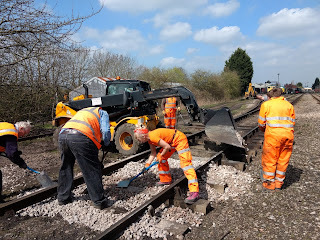 Having completed the ballasting of the second turnout, we moved towards the loco yard a bit and ballasted known voids, then jacking and packing some dips we had noticed. 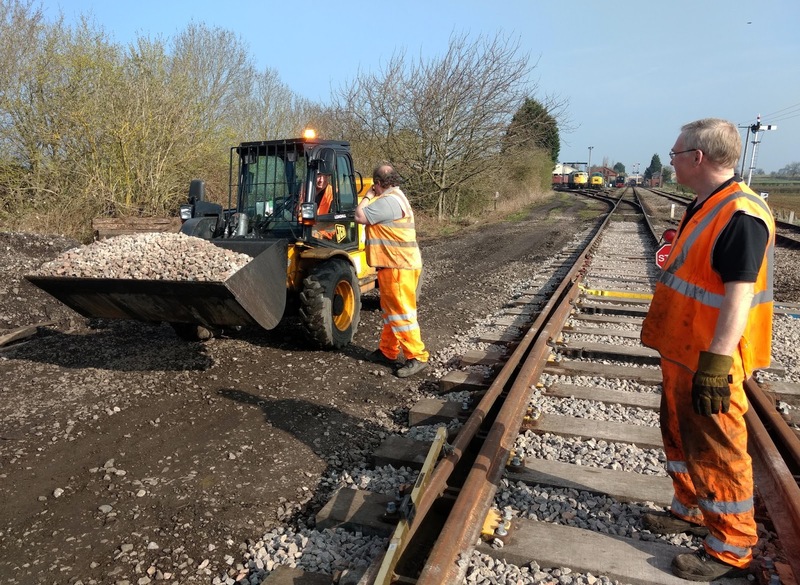 Alan and Steve did shuttles with ballast from the car park, which was very full and some people parked too close to our ballast pile. We managed. 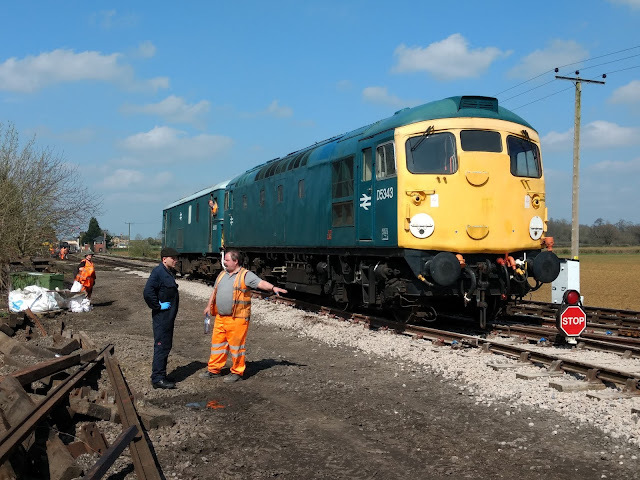 Here we are even closer to the yard, with the first diesel locos parked up on the right already. It was now so hot all jackets were ditched and some were in shirt sleeves after lunch. The day ended with 17.5 C ! Stevie came and carefully dropped bits of ballast in voids that had been there for some time. Afterwards we felt that a very good job had been done, it all looks very much neater now. 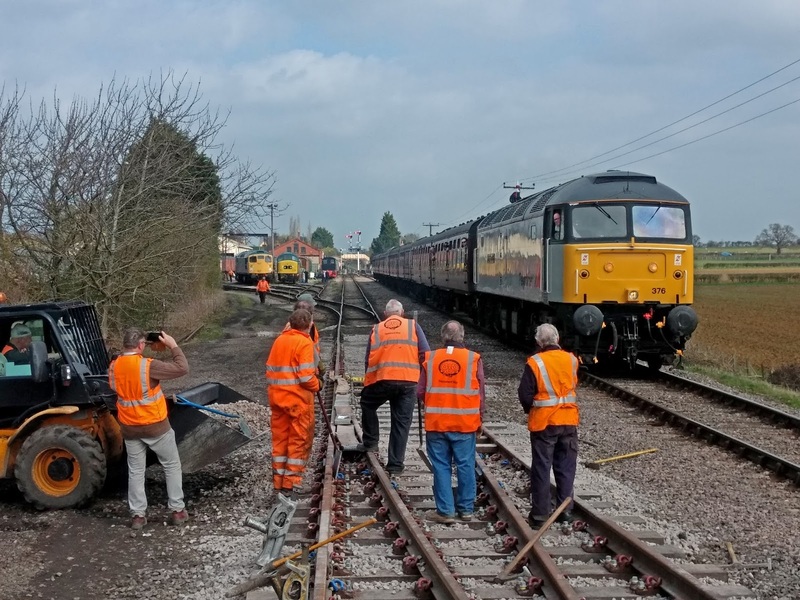 During the ballast spreading and shoveling exercise nearer the yard, some diesel loco shunting went on in between deliveries. 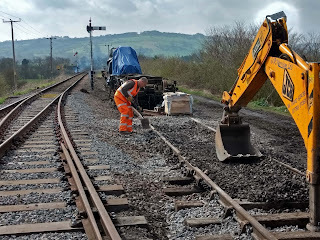 Here the shunter is waiting for us to level off a recently arrived pile, then we let him through. He had quite a train in tow, hauled by the class 73 stuck between the Peak, a canibalised class 20 and this class 26 up front. I said NO. You are not allowed on the new turnout yet. What part of STOP can't you understand? 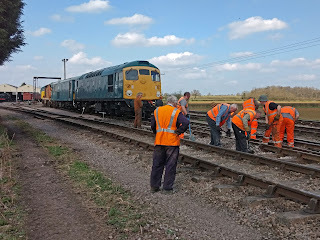 Humour appart, we were happy to borrow two locos to try out on the recently packed northern half of the second turnout, to see how much it deflected. 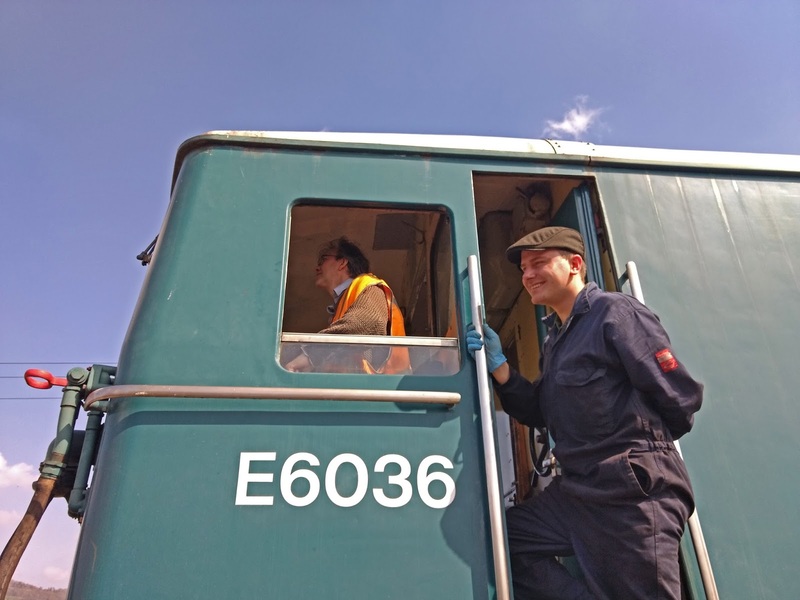 Richard at the controls and his shunter Dan really enjoyed their work. 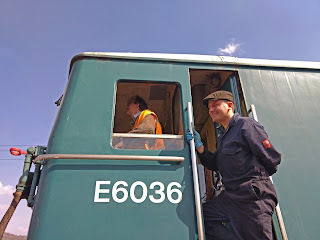 It was good to see Dan, who is a second generation volunteer on the GWSR. His father Greg took part in the opening ceremony to Winchcombe in 1987. 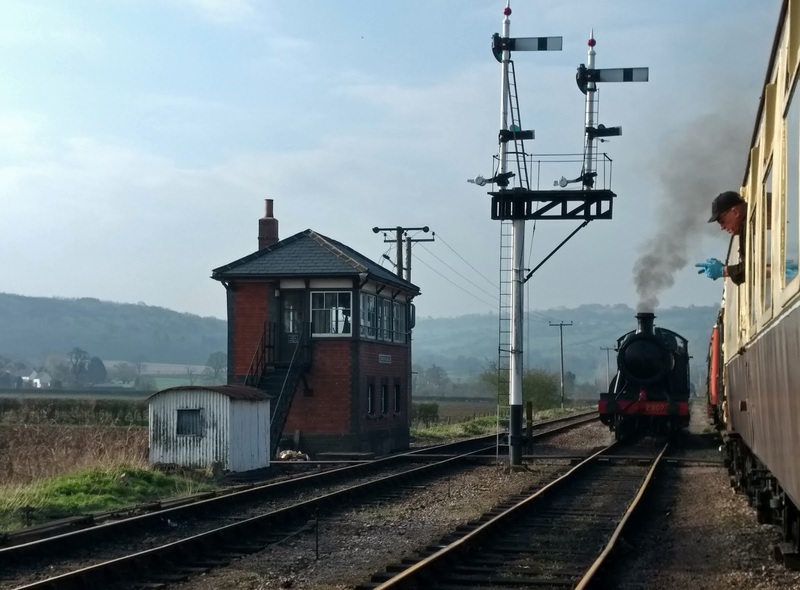 At the end of our day the 'kettle' returns from Winchcombe with the penultimate train north of the day. The second turnout is now just about finished. 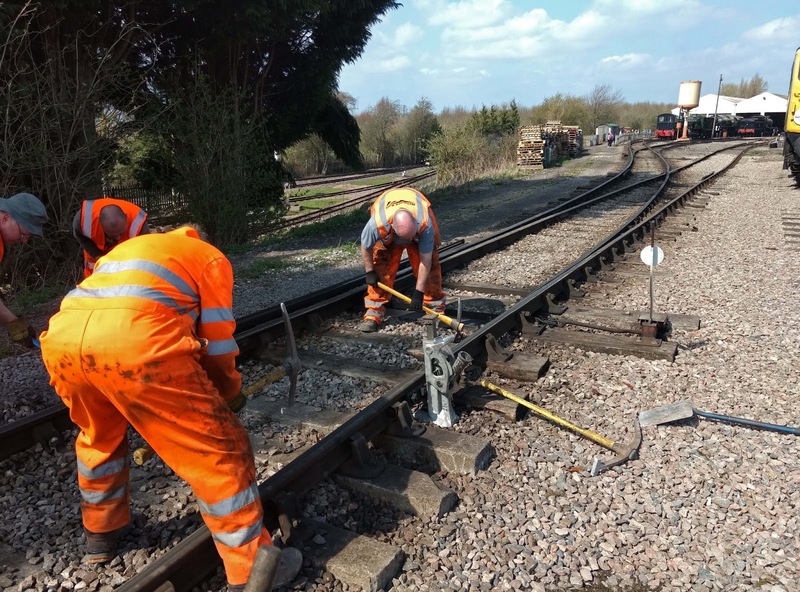 A few small jobs remain outstanding, such as replacement of some sets of fishplates with insulated ones, and perhaps a last tamp with Kango hammers. We will know more next week. Here is a final overview of both turnouts at the end of the working day. Looking good ! A day spent at Broadway on Friday helping with a number of jobs. Following reports of cloudy cameras a volunteer (Dave) came out to effect a repair and reports that the issue is damp inside the lens. The lens in question was cleaned but the problem really needs to be cured by better weather. Perhaps we are now off to a good start, after, we read, the wettest March in 40 years. Two volunteers spent Friday cleaning up this original board, bought at auction a while ago - you can still see the label on the left. 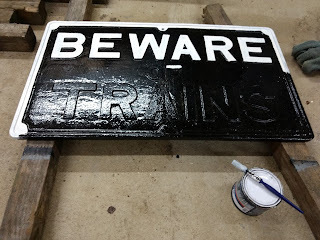 On very close inspection of the paint it turned out not to be white on black, but ivory on chocolate, and this from the start. If this is correct for 1904 we may well replicate those shades. 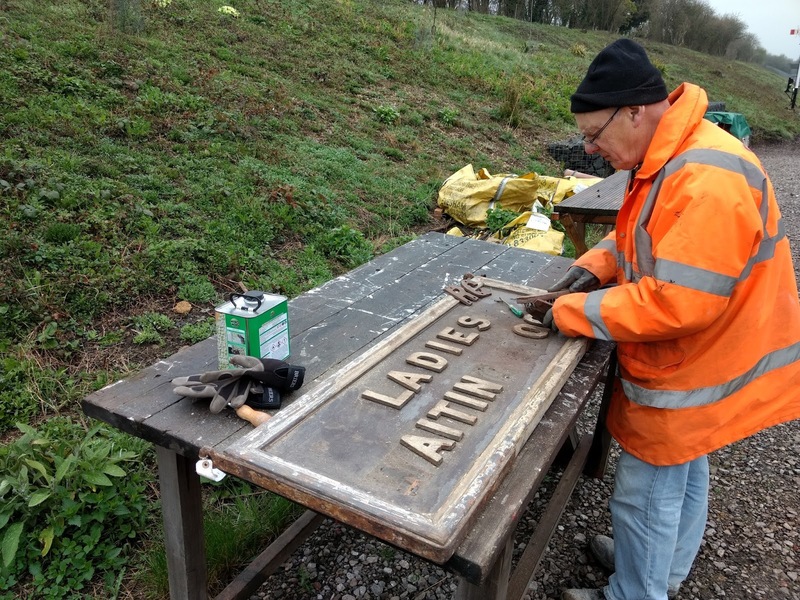 The board originally said LADIES WAITING ROOM and we will drop the WAITING bit to turn it into LADIES ROOM, as on the door plate. This one will be a two sided board, suspended from a truss as there is no room to put V boards by the toilets, due to the long arch there in the new building. 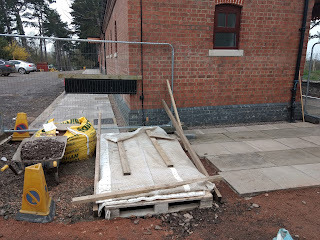 The (part) heritage toilets seem much admired - a group of ladies came specially to see them, we heard - but there are a number of leaks in the copper pipework, which (we hope) were sorted out by a visit from a plumber on Friday. 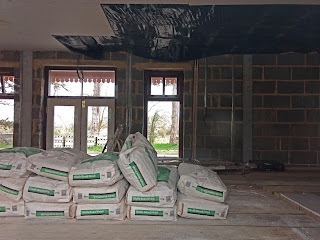 The kitchen and part of the cafe ceiling have had plasterboard fitted by the BAG gang. Here is a view of the cafe, with a raised floor to allow the ceiling work to continue. Money remains very tight at the moment, but enough has been found to allow a plasterer to come next week and skim the ceiling and walls. 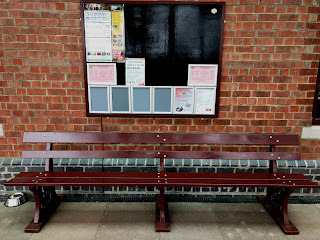 Platform side, 8 plastic frames have been attached to large boards fitted to the walls. At the northern end a hole has been dug to take the foundations of the spearhead gate and cast iron posts that will lead to the canopy overhang due to go in on the right here. The manufacture of the steelwork for the canopy overhang and steps is currently under discussion. Meanwhile, the first of the replica cast iron BEWARE of TRAINS notices is being painted. It was cast using a genuine one provided by a supportive member. More could be cast if there is sufficient interest, with any profits going to the railway. Excellent photos of the turnout packing work. So glad that the weather was with you today. 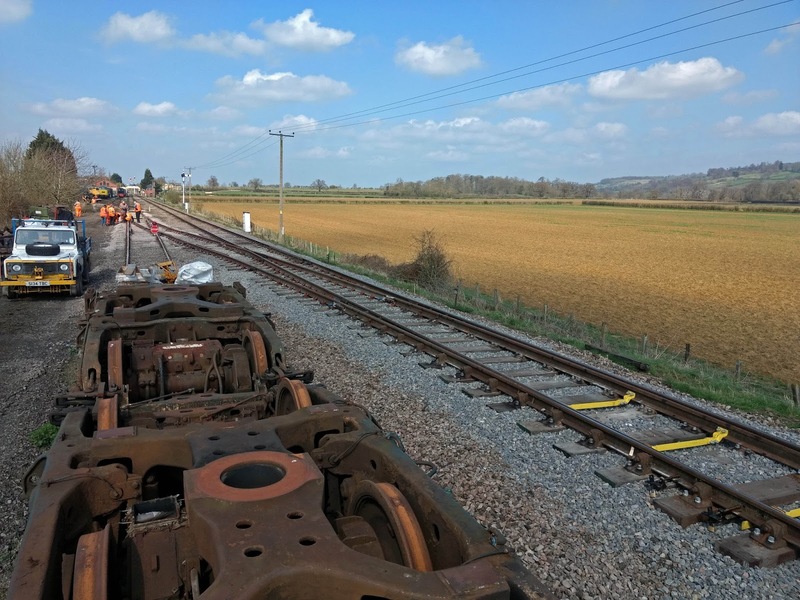 Thanks too for the Broadway update, as there is nothing from the Broadway blog at present! We know that they have 'downed' to Mondays and Fridays but the blog itself being downgraded was not mentioned. So any and all updates are always welcome. It’s good to see that you had some decent weather for once and that you are making good progress on the turnout and associated track work. Am I correct in assuming that S&T will be installing point motors for each end of the turnout? Thank you for keeping up to date with occurrences at Broardway and keeping it in the public eye. 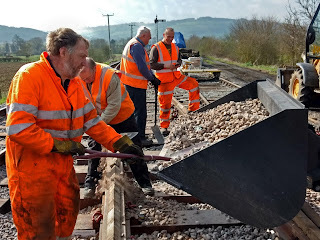 Has the Broadway Rebuild blog come to an end now and do you know if there are any plans for a Broadway Station blog? 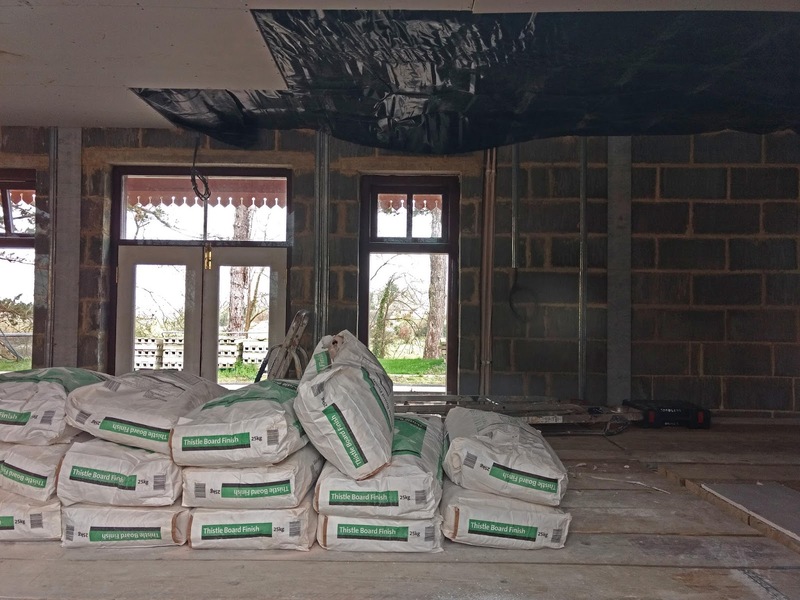 It is good to see that the fitting out of the cafe is progressing and that some money has been found to pay for a plasterer to come in. I think this is an example of where you need to spend a little money to make money and to allow the cafe to open. 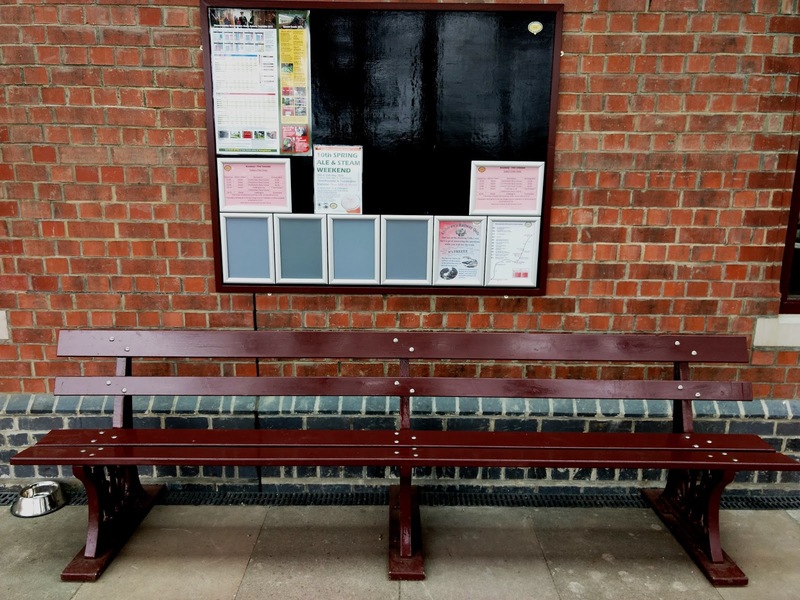 Has anything been said about what style of tables and chairs will be bought and if they will compliment the style of the station? There will certainly be one point motor, on the main line. The other I don't know, but as that siding is almost never used a simple lever would surely suffice. At this point in time we have given some thought to the interior decoration of the cafe, but not yet about tables and chairs. We really need to earn some cash from operations to build up reserves for the budgeted constructions of S&T building and loco dept mess room, long promised. So far we've had just 2 weeks of trading to Broadway, and while that looks good, we need a lot more to build up some serious cash for the planned investements. A budget is not cash ! We are on the right road though. Paul, As far as I understand, only the mainline switch will be motorized. 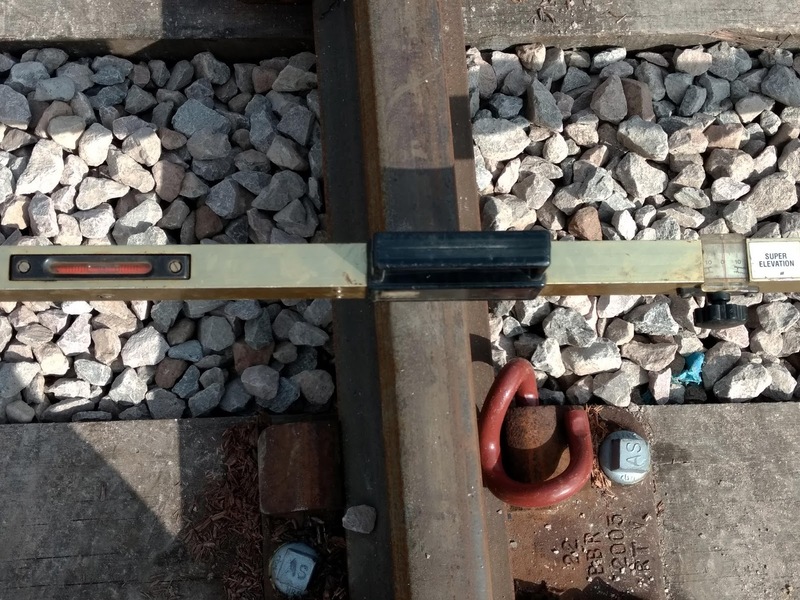 The headshunt will have a ground lever at the most, or just be semi-permanently clipped to lead to the mainline. 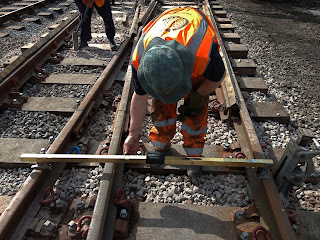 Without wanting to get into the detail of one particular location (as there are nearly always exceptions to the "general rule") the general rule is that there should be some form of trap between siding and main line to prevent runaways entering where they should not. 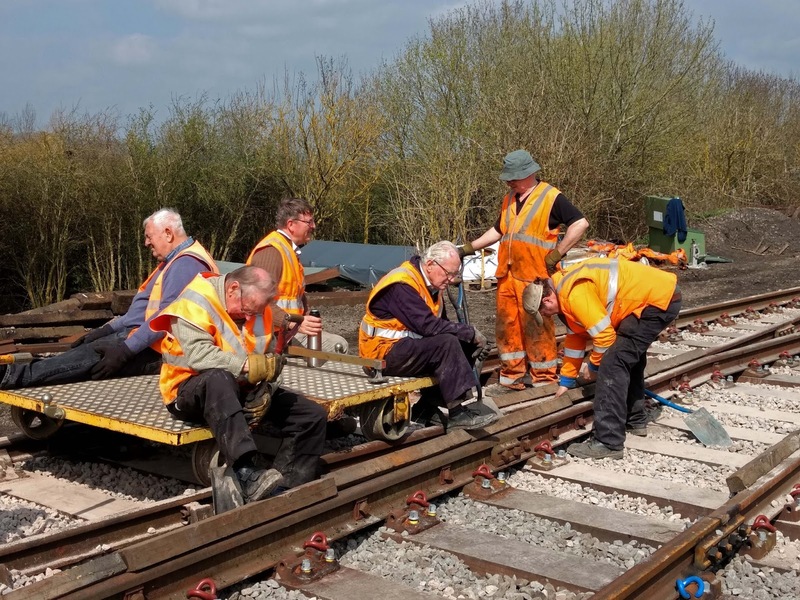 In instances like a crossover between sidings and main line, you'd normally expect the lead in the siding to lie normally for the siding, and only reversed when appropriate authority has been given (eg by the signalman) for a move from siding to main line. 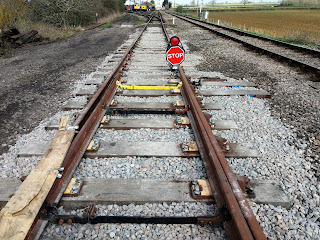 I'm pretty certain that Signalling Principles and the ORR will insist on Trap protection between the yard and the main line, so both ends of the crossover will need to have motors fitted. Presumably there are some spaces in the lever frame for the 3 extra levers to work these points and their associated signals? Are the two loop overuns at Broadway similarly protected? Thank you Joe for the update for Broadway. Regarding the camera, it has improved somewhat but why are the pictures of a sepia appearance or is that the damp problem still?